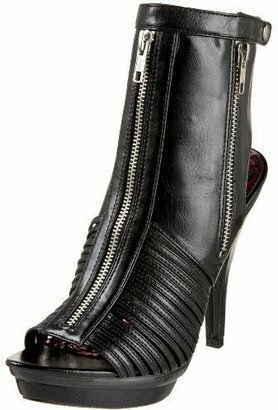 Proenza Schouler takes the open-toe boot trend to a whole 'nother level with this pair of futuristic heels, on sale for $477.98 (down from $1,195) at endless.com. Daring fashionistas will be happy to know that Michael Antonio offers this look for less. 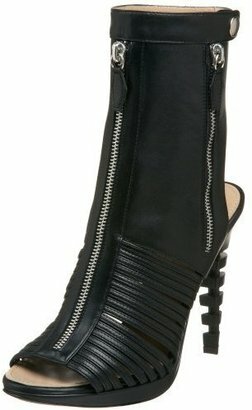 Get the "Miller" ankle boot on sale for $44.53, also at endless.com. Thanks to reader fashion court, I was able to get my first look at the Jean Paul Gaultier for Target Designer Collaboration lookbook courtesy of Refinery29. While the disjointed, outdated styling is a turn-off, when you start to look at the individual pieces, there is a lot of potential. (This scan from the pages of Elle magazine makes it look much more promising.) Highlights for me include a beige trench ($59.99), brown leather bomber (worn by an absolutely stunning model, btw. Look at those thighs! ), and a yellow Marilyn Monroesque sundress. Prices range from $17.99 for swimsuit separates to $199 (ouch) for leather jackets. Mark your calendar for March 7th when Jean Paul Gaultier for Tarjay hits. Keep reading for all the looks!